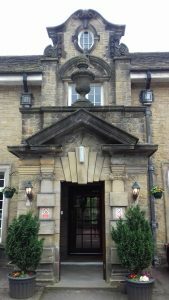 I was honoured to be asked to present a talk on the York Grand Lodge at Criterion Chapter of Installed First Principals which meets at the Masonic Hall at Hoyle Court in Otley near Shipley in West Yorkshire. Hoyle Court is a Baroque Mansion – an architectural delight that was once the home of the Ambler family and is now the meeting place for a number of lodges and chapters. The talk was indeed a topical one and was greatly received with over a hundred Companions attending. The chapter also hosted the meeting for the Bradford &District Royal Arch Council which works to promote the Royal Arch in the Province.